Many popular houseplants, such as cactus, are native to tropical deserts. Tropical desert plants make excellent house and yard plants since they can thrive on very little care. Most of them require very little water and flourish in hot, direct sun and in poor soil. They are a good choice for someone who doesn't have a lot of time to prune and maintain flowers. They are stunning viewed in their natural habitat. Desert plants are able to survive hot, dry environments because they have adapted over time. Large leaves have given way to few leaves, or spines. A large surface area on a leaf allows more water to evaporate from the plant. With fewer leaves, photosynthesis must occur in the stem. Many stems hold water and some cactus varieties will "slosh" if gently rocked, due to the water they contain. Many plants utilize spines for defense because they are very slow-growing. With few or no leaves, the photosynthesis process is much slower. Waxy coatings and hair help insulate the plant and make water loss slow. The hair envelop the plant in a microlayer of humid air. Large underground root systems can spread for large distances or grow straight down to access ground water if it is available. Many desert plants can inject toxic chemicals into the soil to kill their competitors' roots. Sturdy, extensive root systems allow desert plants to maximize the available rain water. Cactus are probably the first desert plant that comes to mind. There are more than 2,000 varieties of cactus, and they vary greatly in size and shape. Some, like saguaro, grow 40 feet or taller. Many, but not all, have spines. Flowering cactus are especially attractive against the stark, barren landscape of a tropical desert. Holiday cactus, of which the Christmas cactus is probably most familiar, are unusual in that they do not grow on the ground in thier natural setting. Instead, they grow in the crotches of larger trees in subtropical rainforests. 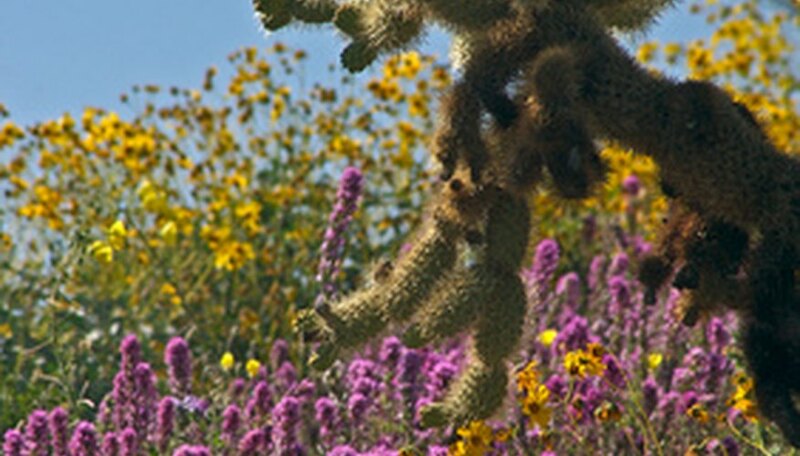 The tropical deserts are hosts to a large variety of wildflowers, which bloom in a riot of colors. Different species bloom at different times of the year, offering year-round color. Beware their beauty, though: some varieties, such as dogbane and datura, are poisonous. Dogbane contains a toxic chemical that can be fatal. Until 1952, this chemical was used as a cardiac stimulant. Never pick or handle any part of a desert wildflower unless you are well-versed in plant identification. The Joshua tree is one of the better-known desert trees. This member of the yucca family grows only in the Mojave Desert. Joshua trees grow in dry soil on slopes and plains and often form groves. Shrubs and trees in tropical deserts are evergreen and drought resistant. Creosote bush and sagebrush are sturdy shrubs that grow in abundance. Perhaps the best-known symbol of the Old West is the tumbleweed. This grass, which looks like a collection of dead limbs, can become as large as a Volkswagen. Many people are surprised to learn that young tumbleweeds produce tiny blooms. As tumbleweeds roll, they disperse seeds--a typical plant has around 250,000. In many areas, this is considered a weed and treated with herbicides.